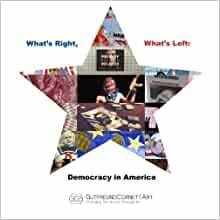 Gutfreund Cornett Art, a curatorial team with a mission to “Change the World through Art”, asked for work that in the upcoming election year reflects on democracy in the United States. What is happening within our borders with the increasing polarization of our political parties and how do our views of democracy affect those outside our borders when we try to spread the American Dream? How does increasing surveillance affect the tenets of democracy? We have both freedom and a lack of privacy in this digital and Patriot’s Act world as drones and wiretaps are commonplace and virtually unquestioned and unopposed; but do we have a voice in any of this Big Brother culture and with voting restriction laws being passed across the country to silence particular demographics of the American public. How does the media portray democracy -- truth vs. spin? What is actually news versus entertainment in bombastic, biased editorials? Artists consider democracy in relation to civil, personal and political rights, economic gain, and the debate over freedom of speech, freedom of choice and freedom to choose to live as you wish. What did our forefathers intend in the Constitution with the freedom of speech, the right to bear arms, the pursuit of happiness, etc. To whom do these tenets apply in a racially, religious and politically divided country? This show was juried by Dr. Kathy Battista, Founder and Director of the MA Contemporary Art program at Sotheby's Institute of Art. Twenty-three works by twenty-one artists will be installed in the gallery portraying themes of democracy, women’s rights, LGBT issues, privacy and surveillance, the 1% and money, race, gun rights, immigration, environment, and other political issues and processes. This international juried exhibition showcases work by Nic Abramson, Ransom Ashley, Michael D'Antuono, Cat Del Buono, Justyne Fischer, Lindsay Garcia, Shawna Gibbs, Ruthann Godollei, Ingrid Goldbloom Bloch, Emily Greenberg, Gracie Guerrero-Bustini, Shreepad Joglekar, Monika Malewska, Victoria Helena Mihatovic, Kate Negri, Gina Randazzo, Sinan Revell, Nick Schmidt, Laura Sussman-Randall, Dan Tague, and Eike Waltz in the gallery and forty-two additional artists with sixty-one works to be shown together on a monitor in the gallery in order to accommodate as many viewpoints as possible and expand the conversation beyond the physical limitations of the gallery. 5.0 out of 5 starsLove this catalog! Wonderful collection of socially and historically relevant art. A very thought provoking and inspiring catalog!